You can reveal 1 “Abyss Actor” Pendulum Monster and 1 “Abyss Script” Spell in your hand; add 1 “Abyss Script” Spell from your Deck to your hand, with a different name than that revealed Spell. While you control a Pendulum Summoned “Abyss Actor” Pendulum Monster, any monster effect activated by your opponent becomes “Destroy 1 Set Spell/Trap your opponent controls”. You can only use each effect of “Abyss Playhouse – Fantastic Theater” once per turn. The final Abyss Actor support we will look at this month will end our week off like the last three weeks did, Abyss Playhouse – Fantastic Theater. Fantastic Theater is a Field Spell that lets you reveal one Abyss Actor Pendulum Monster and one Abyss Script Spell to add one Abyss Script Spell with a different name from the revealed card from your deck to your hand. 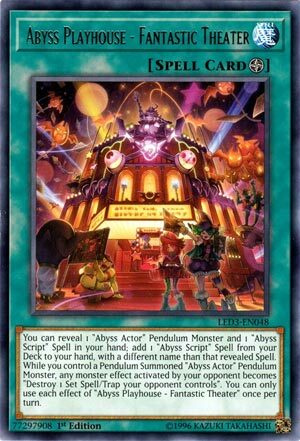 Revealing what you have if you aren’t using it isn’t too good, but you’ll likely use the Abyss Actor Pendulum Monster (do they even have non-Pendulum monsters? I guess this is future-proofing if they do get a Link Monster) and then set the two Abyss Scripts where your opponent won’t know where either are. While you control a face-up Pendulum Summoned Abyss Actor Pendulum Monster, when your opponent activates a card effect, it becomes “destroy 1 set Spell/Trap your opponent controls”. Nice way to trigger Abyss Scripts, but sadly this is not optional, so the first monster your opponent uses will become this effect. Both effects are a hard once per turn, so you can’t make multiple monsters pop your Abyss Scripts instead of doing something else. Fantastic Playhouse is nice in theory, but they restricted the effect of popping your backrow a little harshly so I don’t even think this is a mandatory piece in the Abyss Actor deck sadly, if the effect to change a monster effect to popping your set cards wasn’t mandatory, then I’d say this would be staple guaranteed in the Abyss Actor deck. Not to mention that Superstar is probably a better card for getting Abyss Scripts as well. Sorry, but this card isn’t fantastic like the name suggests. Art: 4.25/5 At least the Abyss Actors are having a good time there. I’m enjoying these Abyss Actor (or support card in the case of today) ending the week, they seem Spooky Szn appropriate, as we inch closer to Halloween. Abyss Playhouse-Fantastic Theater, is a Field Magic card, but like many Field Magics, we need see how necessary (or not) it actually is to the Theme and the actual Deck itself, so let’s roll on in here. Your opponent just got to see TWO cards in your Hand, and knows the identity of a THIRD…so they’re going to know what’s coming. I just don’t see that as very good. But moving along, if you control a Pendulum Summoned Abyss Actor card, your opponent’s Monster Effects become to destroy a Set Magic/Trap card your opponent controls. That is, in theory, something that should be helpful. But realistically, what’s to stop your opponent from just destroying this and getting around it all together? Or destroying the Abyss Actor Pendulum card you control instead? Too many variables here, and just not enough consistency or advantage generated from this card to warrant being used. The theme can do without it, at least in my opinion.